High temperature-rated casing spacer/isolator for use with small diameter pipes. Model HT Casing Spacers/Isolators are uniquely formulated to withstand high temperature applications (280° F / 138° C), and are designed primarily for smaller diameter steel or polyethylene carrier pipes (ANSI O.D. pipe without a bell or mechanical joint). HT casing spacers are available to accommodate a variety of pipe diameters and available for quick delivery. For carrier pipe diameters (Nominal Steel & IPS) ranging from ¾” (19.1mm) to 12” (304.8mm) up to 1,000 feet. Spacing recommendation: Max 8’ (243.8cm) between spacers, Max 2’ (61.0cm) from casing pipe end. HT Models 6x10 through 12x16 are sold with TPE Liner. 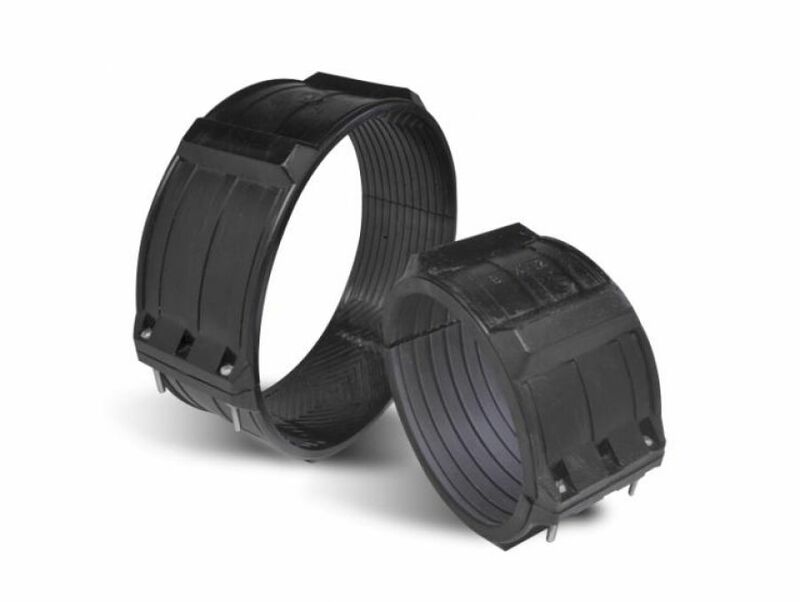 Recommended end seals: Model S, C, W, FW and R.
A Hi-Temp casing spacer system designed to ease carrier pipe insertion with quick installation to last the life of the piping system.